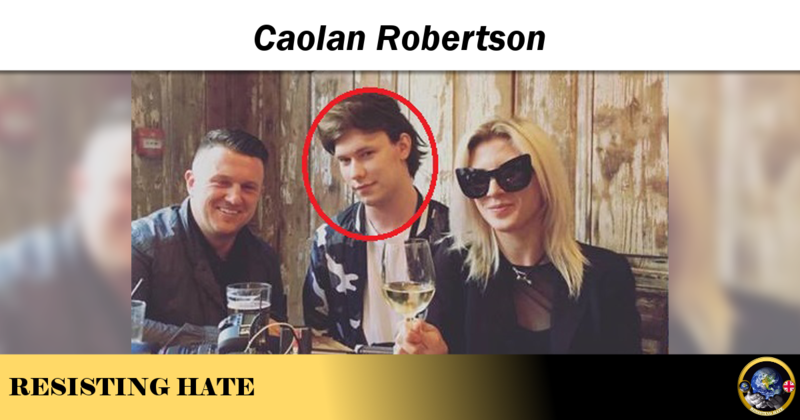 Today I’m writing about a little man (who you may have noticed has latched on to the likes of convicted fraudster Stephen Yaxley-Lennon and the “leaders” of Britain First) who goes by the name Caolan Robertson. This self styled mini-Milo describes himself as a “film maker, political writer and social commentator”. He has clearly made a habit of being an irritating bigot as he says that he was studying film at university and they banned him from making a film which criticised Islam. If you have ever been unlucky enough to see one of his ‘films’ then you will see why they stopped him. 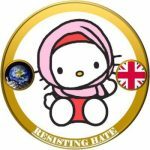 For ‘criticising Islam’ please read – “Ignorant, bigoted rants which are low on fact and high on right wing stereotypes” – just the thing that any self respecting university would want to distance themselves from. It does seem odd that he recently deleted his LinkedIn profile which showed he attended University of the Arts London, and which now merely states ‘a prestigious university’. Liberals don’t hate him. Liberals think that he is a little boy playing at being convicted fraudster Stephen Yaxley-Lennon (that nice savoury character I covered in a previous article on the site. Most of us feel sorry for him as he has clearly been led astray by people with a stronger mind than he does. Republicans don’t want to be him. If there is one thing for sure, the Republican voters from the USA would prefer to be themselves and not some floppy haired little man who enjoys ranting online. Liberals have never been destroyed by him or even had him exhibit a ‘trick’ other than watching him prove to the world that he will never be as effective as convicted fraudster Stephen Yaxley-Lennon and Britain First despite jumping on the coat tails of their ‘success’. For most people, their introduction to Caolan was following the attack on Westminster Bridge. Now, most people were shocked by this and their first thoughts were with those who had been killed and injured in this atrocious attack. However, convicted fraudster Stephen Yaxley-Lennon and Caolan were busy filming in London so they decided to have their little input into what happened. Looking back over the footage on YouTube filmed on the day, it starts to look more and more like Caolan is actually playing at being a news anchor. He looks earnestly into the camera as he just parrots everything that has already been reported by real journalists. He has no scoop, no footage, nothing……he just stands and says things like “Sky news is saying xyz…” but the only thing he actually adds of his own is the predictable: “It is no surprise it is Islam that did it” at the end. convicted fraudster Stephen Yaxley-Lennon didn’t really help Caolan’s case when he came on, ranting at the press who surrounded them that “Islam is the problem…..” (Apparently they are all over Luton and stand next to him in the bank). This hysteria seemed to rub off on the young man who then decided, when Tommy had finished his rant, to continue where his mentor had left off. 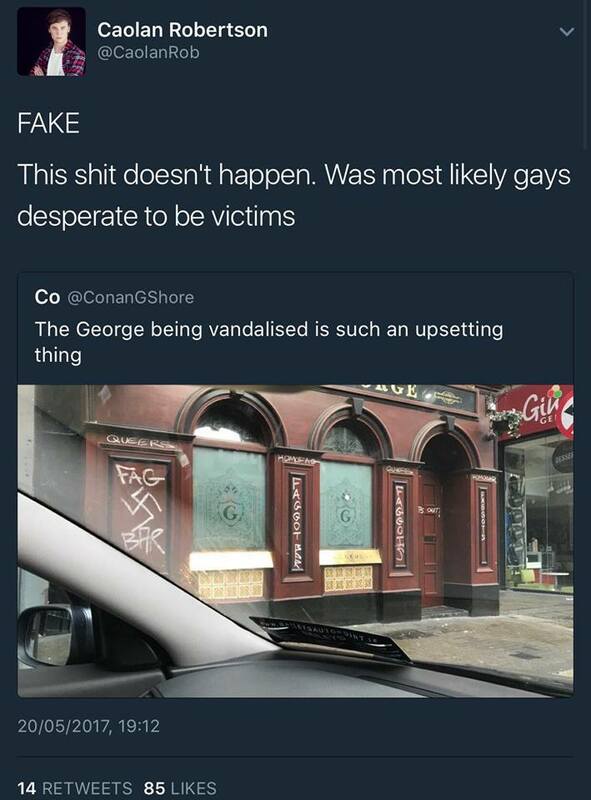 Caolan insisted that: “Blood is on the hands of people like you [the media] and the Left.” He then stated that the: “Left had allowed this attack to happen unnoticed” (I’m still baffled about what he meant by this). He then proceeded to abuse some of those present personally. It seems Caolan is also associating with Jack Buckby who now writes for the Spectator . I will be covering him in depth another time but in the meantime here is a Huff Post article about him. 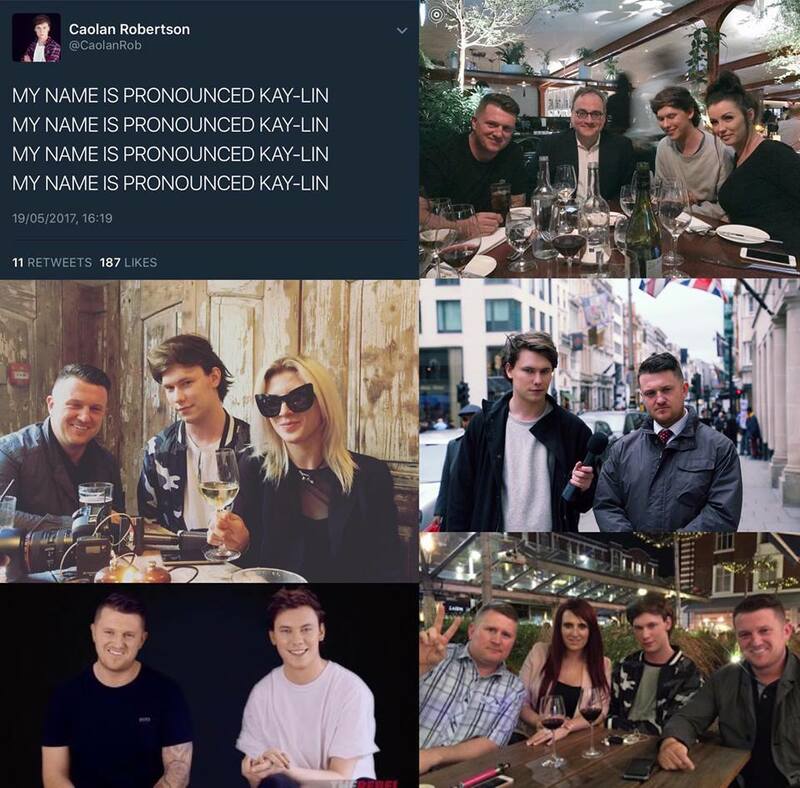 Caolan next popped up associated with convicted fraudster Stephen Yaxley-Lennon again but this time also with Jayda Fransen and Paul Golding. The foursome were photographed at a trendy wine bar planning the combined Britain First/EDL shambolic London shuffle. Since then Caolan has been getting more and more extreme. His opinions can be considered neither stable nor rational and he keeps making wild unconfirmed claims about being targeted by Antifa at his house. He has been filmed stepping out from his property while stating that Antifa have exposed where he lived (Well, you’ve done that yourself Caolan as you’re shown yourself walking down your front steps while confirming that you live in Chelsea…….durrrr!). In addition to this idiocy Caolan has been spending inordinate amounts of time with convicted fraudster Stephen Yaxley-Lennon in an attempt to ‘expose leftists’. Because of the supposed Antifa attention, Caolan says that he is going to double his output in exposing the names of key antifascists. If you are going to ‘expose antifascists’ you need to realise that being so vehemently against ANTI fascists indicates that you are part of the problem in society. If you are going to “double your output” you need to find new stories and not re-hash old ones as that is just boring and nobody takes you seriously. 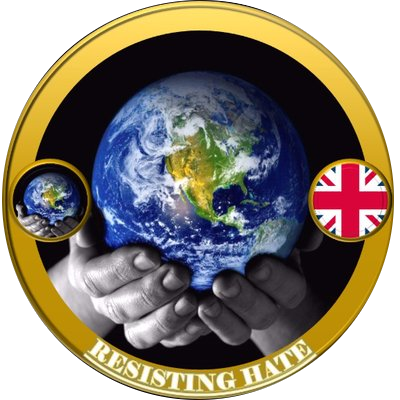 Distance yourself from convicted fraudster Stephen Yaxley-Lennon. He is not exactly someone who gives you credibility. Stop pretending to be a reporter. You’re not one. You can’t jump on a news story presented by a legitimate news source and then just add your own “It’s Islam who are the problem, because I say so.” By doing that you are showing how short sighted you are in your views. You might want to ask a real news company if they would be willing to take you on as an intern so you can see how real news is reported. Steer clear of homophobia. Your comment about “gays wanting to be victims” on twitter makes you look stupid (at best) and unable to provide a strong media opinion. (It all comes back to personal image and how you want to be perceived). By the way Caolan, your whole stance of “Feminism, Muslims and liberals are all bad” has been repeatedly covered and if you actually want people to take you seriously you need to find a new angle. As I’m sure that Caolan will be mixing with more and more people who will be radicalising him further, I’m sure that he will come up in future posts written by myself and the Resisting Hate team. (I am actually looking forward to seeing what else we can find on the net about this wannabe far right journalist). I have only just heard of this guy, and stumbled across this website whilst trying to find about him. This page is full of hate! I get it, you don’t like him… Maybe I won’t like him either. Your pathetic bullying goes beyond the pale. Maybe you need to learn to love??? Andy is actually Caolan trying to arouse sympathy. It won’t work Andy/Caolan we all know that you have a crush on Tommy “Tubby” Robinson. Robertson is a posh little prick making videos from his Mum’s house. He was cosseted and given everything all his life and cannot see outside his own white middle class echo chamber. The left has not been in power in the UK since 1979, so how are they responsible for anything? He is just a little boy who hasn’t actually worked at anything in his life, in short his mammy and daddy pays for his life. The only hardship he’s had is when he gets a little cosipated after having a curry the night before. Exactly Paul. They may call themselves conservative whilst they are libtards, Islamists, etc. There was no conservatives in the true sense of the word in the UK for many decades now. Hmm – dat aggression though. Honestly, no need. On the programme “who should we let in” Ian Hislop demonstrated the “give a person enough rope” interview method when he spoke to that Hopkins woman. The more she opened her mouth, the more vile and repulsive her POV was shown to be. Let us simply drop questions borne from critical thinking, logic and reason at this errm (for want of a better word) person. His answers will soon show his flawed “logic” (again for want of a better word) for what it is. The more noise he makes, the more ridiculous he sounds. Yes. Thanks for replying, PS, really like some of your music. I Saw Beauty is great. 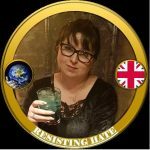 An article from an organisation called ‘resisting hate’ that is nothing more than a hate filled ad hominem, personal attack on this young reporter. Absolutely nothing of substance, no stats or facts, just an ideological opinion piece, spouted by someone who is clearly so entrenched and tribal in their views that they are like a little child spitting the dummy out and screaming insults. Re not being original, he’s just started. Why don’t you check this latest piece about Muslim only housing…I do believe he is the only person covering that. And be sure to tell yourself that is not hate, that is not discrimination …..because it’s from the poor little moooslims… aww. The utter cognitive dissonance and dishonesty from ‘your side’ is plain for all to see now. With every ‘article’ like this you nail your own coffin. Jesus! What a hate filled load of drivel, the msm is so far left that it can’t see the truth, you are helping to destroy this once great country. British people are waking up.. Including the brainwashed kids of today. Ah, ‘the polls’! As if we are in some way ‘democratic’. What’s ‘For Britain’, by the way? I have tried to reply to two comments here and both times they have been refused by the Left Wing Thought Police who suppress Freedom of Speech. These people are Traitors. Europe in general and England in particular are is being destroyed by these people. It is now time for those of us who love our country to rise up as one, just as our Fathers and Grand Fathers did and deal with these Left Wing Criminals, for the sake of our children and the future of England. Actually we screenshot your previous offensive comments and circulated them on social media. Fossil fuels like coal and oil supplied us with the essential resource to produce our very own electricity using the use of generators in power plants.